Downtown Houston’s second convention center hotel has the financing to move forward with an April groundbreaking, the development companies said this week. 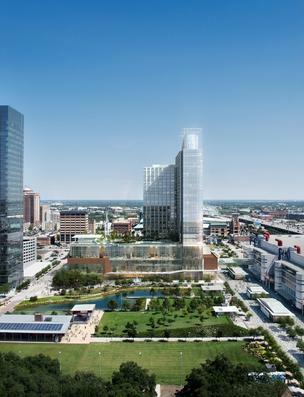 Houston-based Rida Development Corp. and Los Angeles-based Ares Management LLC said in a Dec. 5 statement that they secured funding from a six-bank consortium to build the $335 million, 1,000-room hotel, which is expected to break ground April 11 and be complete in 2016. San Francisco-based Wells Fargo & Co. (NYSE: WFC) is the lead agent, with Birmingham-based BBVA Compass as the co-agent, for the consortium, which also includes New York-based CIT Bank (NYSE: CIT), Oklahoma City-based MidFirst Bank, San Antonio-based Frost Bank (NYSE: CFR) and Pittsburgh-based PNC (NYSE: PNC). Earlier this year, Houston First Corp. and Rida finalized the development agreement for the hotel. At the time, they also finalized Houston First’s portion of the financing — which funds the acquisition of the hotel site, construction of an adjacent parking garage and other improvements to the convention district — and authorized Houston First to transfer the hotel site’s land to Rida. Additionally, the development companies recently executed definitive agreements with Maryland-based Marriott International Inc. (Nasdaq: MAR) to name Marriott the manager of the Houston Marriott Marquis. The hotel was named a Marriott Marquis late last year, as well. Houston will be the sixth city in the U.S. with a Marriott Marquis. Houston-based Morris Architects unveiled renderings of the hotel late last year. The project will create more than 1,800 construction jobs and add 700 permanent jobs, according to the Dec. 5 statement.